Sustainable farming was rewarded at this year’s Outstanding Young Farmers awards ceremony with both national winners focused on soil ecology and the environment. 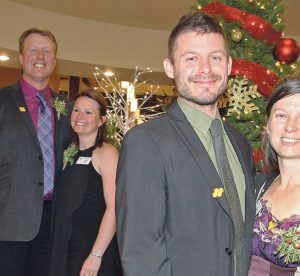 Grain farmers Derek and Tannis Axten of Minton, Sask., and produce growers Francois Handfield and Veronique Bouchard of Mont Tremblant, Que., were selected from seven provincial nominees during an awards ceremony Dec. 1 in Penticton. Meeru Dhalwala, a British Columbia restaurateur and author who helped pick the winners, praised all the nominees for their innovative practices. She called the Saskatchewan couple brave for taking risks. “They got a functioning wheel and took it apart,” she said. The Axtens, whose two children represent the fourth generation on the family farm, said they hoped to inspire others and be inspired by farmers like those represented at the national conference. “(OYF) showcases farming, doing things outside the box that are innovative and exciting. It’s great to come at farming from a different perspective,” said Tannis. Derek said the networks formed here will serve them well into the future. For the Quebec couple, their priorities are encouraging others to consider farming as a career and putting a human face on the industry. “See the human behind the business and understand the day-to-day life of each farm. The only way to understand it is to spend time together,” said Handfield, who suggested making connections with young people in schools. “To get interest is to go into schools and show farming as a good way of life and then support them from a young age, from college and when making their business,” said Handfield. Bouchard said farming is a good career. “People see the farm as hard work that’s hard to make a good living at. We have to show positive examples of how farming can be viable. You can have holidays and have a normal life and have fun and realize our ideals,” said the mother of two children. Handfield stressed the need to mentor farmers interested in organics. “For an organic vegetable farm, you don’t need too much capital. The trick is to get knowledge and labour,” he said. Environmental concerns were top of mind when the Quebec couple built their organic produce business from scratch. Handfield and Bouchard developed their certified organic Aux Petits Oignons, a direct marketing vegetable enterprise on 10 acres. They built greenhouses that incorporated sustainable materials and energy conservation into the design and manage their climate and irrigation with the latest technology. They also worked with a human resources expert to improve conditions for their workers in the labour intensive operation. The business sells produce at the farm and through local markets, offers weekly food baskets and tours and engages student trainees. Axten Farms has focused its efforts on improving soil health in recent years through companion crops, cover crops and composting, resulting in the need for fewer inputs. In addition to restoring balance to their soil, the couple also seeds a diverse mixture of crops following harvest that are not in their annual rotations. They grow until freeze-up and are then lightly grazed by another producer’s cattle. Other award winners during the OYF national conference Nov. 30-Dec. 3 included dairy farmers Joan and Doug Cranston of Ancaster, Ont., who received the W.R. Motherwell award for their dedication to the association and the agricultural community.